Last week we began a journey through beautiful Macau, the former Portuguese colony just an hour away from Hong Kong by ferry. 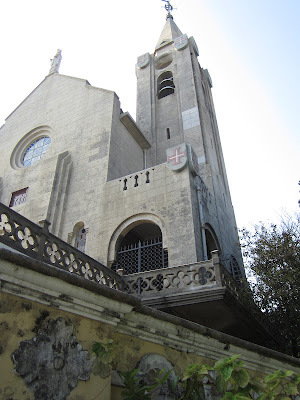 The first part of the Macau tour focused on the Portuguese buildings and the quiet, old fashioned side of Macau. 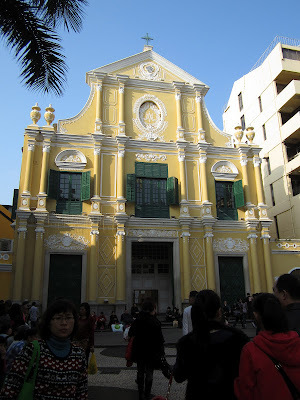 We resume our tour today at the ruins of St. Paul's Cathedral in the heart of the tourist district to see the other, infamous side of Macau. Just to remind you, we saw a dragon dance in front of the ruins of St. Paul's Cathedral. We walked up the steps to the famous facade. There's a brief detour to the left of the ruins that brings you into a little side street. If you haven't had your fill of beautiful European-style houses, this is the place to look. 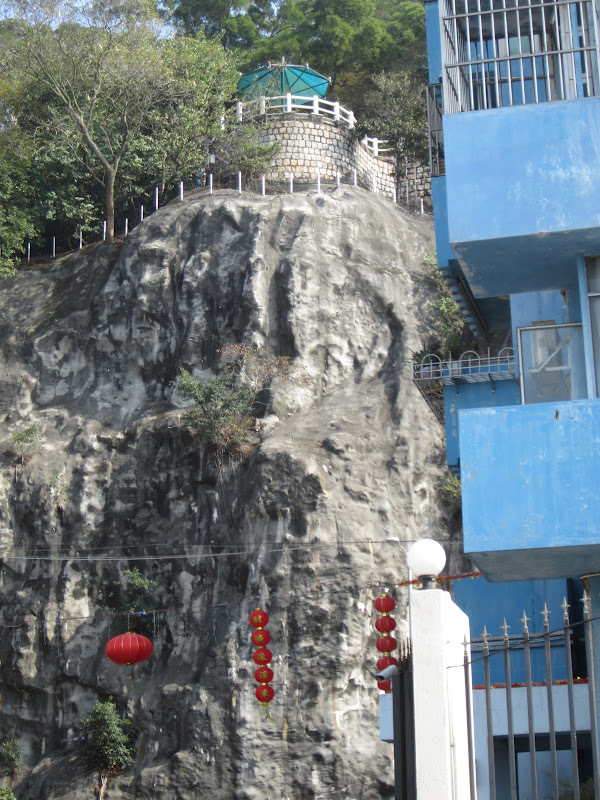 On the opposite side of the steps, you can climb up a hillside just past this yellow building. At the top of the hill you'll find the Museum of Macau. The museum is located on the site of a 16th century fortress, and it has an impressive collection of canons on the grounds. 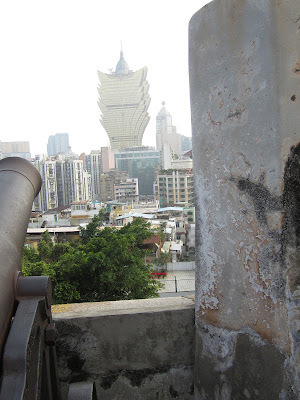 From the top of the fortress you can get a really good look at the Grand Lisboa, the pineapple-shaped casino. We made our way back down the fortress and through a crowded side street, where we found an old house that is open as a museum and exhibit space. 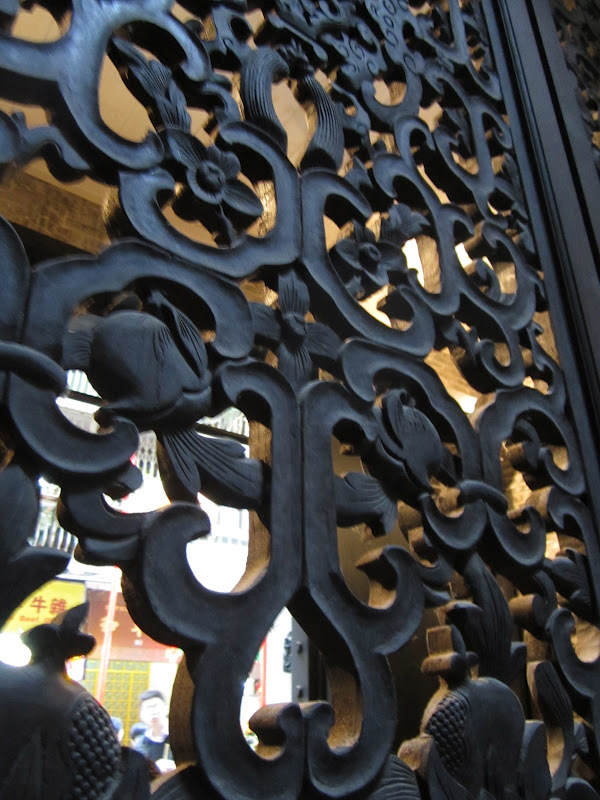 It is decorated in the most beautiful carved wood. The crowds started to thin as we approached an old square. There's a pretty fountain on the right. Beyond the yellow and blue fountain there's an open square with another fountain, marred only by the big screen on one of the buildings. Opposite the screen, there's an old church. You may find it a bit jarring, but when you leave this square you can head straight down the street to casino land. The two casinos that dominate the main strip are the old Casino Lisboa (in orange) and the Grand Lisboa (in pineapple). 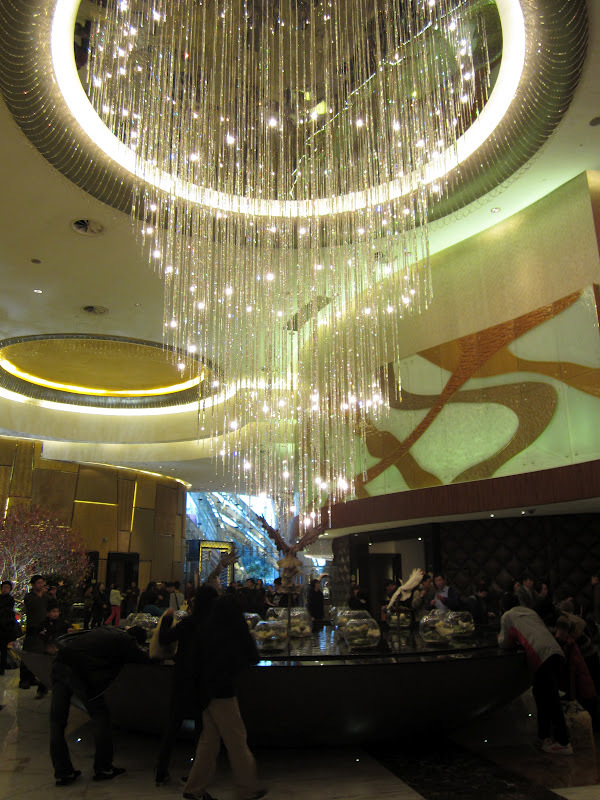 The casinos are incredibly opulent. Inside the Grand Lisboa you'll find an incredible collection of priceless treasures. 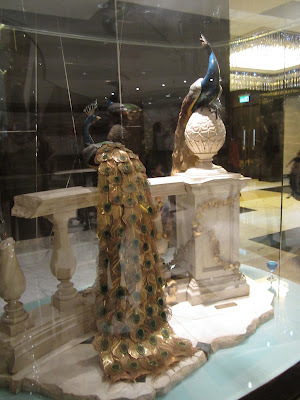 The casino tycoon has a museum-quality collection of gilded, painted and jeweled antiques. There are treasures inside the opulent entrance of the older Lisboa too. You can't take pictures on the casino floor, but the most impressive bit is still the outside. We left the Lisboas and headed over to the Wynn Macau. There are two display areas in the Wynn that erupt into activity every half hour or so. It starts with music and flashing lights, then the ceiling begins to open. The disk in the center rotates and then opens like an egg. A tree of fortune rises from the floor. It reaches toward the ever-changing ceiling. The tree changes to gold, at which point the audience starts throwing coins and gambling chips toward it. Eventually, it recedes back into the floor. Thanks for coming back for the second part of the Macau tour. 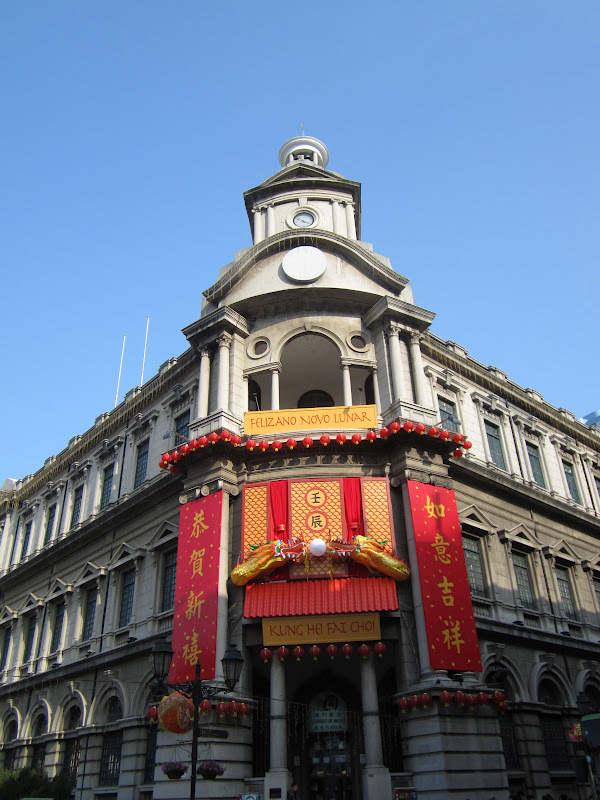 The walking tours will return to Hong Kong next time! This weekend I visited a bookstore in Causeway Bay that was overflowing with readers. The impressive design section was particularly full. I was surprised at how enormous the YA section was. I know YA is the hot thing in publishing, but I don't read much of it. It was interesting to see the physical manifestation of a trend I usually only see through blogs. What's your favorite YA novel? What should I read (apart from The Hunger Games) to get up to speed? Elsewhere in Causeway Bay I noticed two gentlemen having tea with the book Currency Wars sitting on the table next to them. I saw a woman with a Kindle in a cafe. This morning on the train, I saw a schoolgirl reading Jane Eyre. I counted six Chinese books this week, at least one of which was a textbook. What books have you spotted in your town lately? Do you see publishing trends come to life where you live? Here is a video I recorded in October when I finished the second draft of my book. I'm a bit further along in the process now, but I wanted to share all of the little milestones that go into completing a project like this. Check out the writing video tab to see the rest of my writing journey! 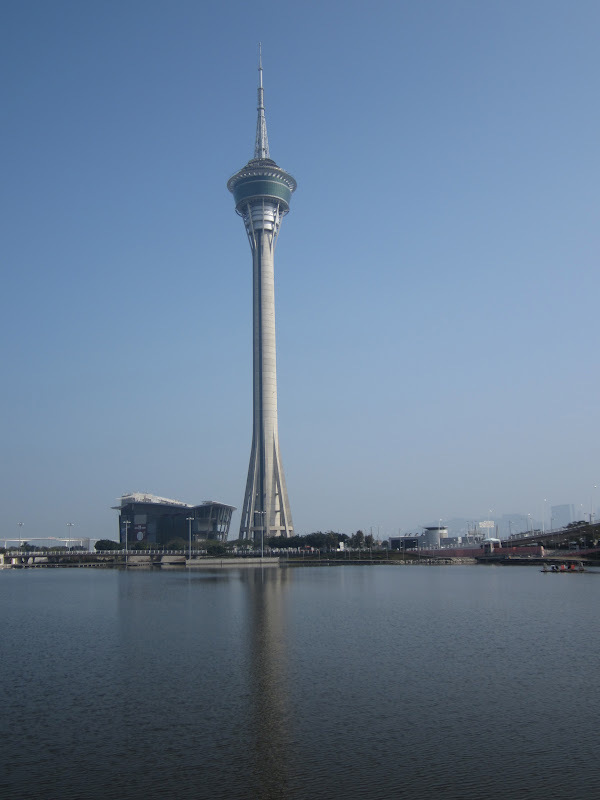 Macau is a nearby Special Administrative Region that is perhaps the most popular getaway destination for Hong Kong people. 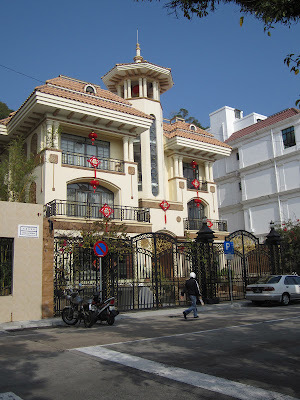 Like HK, it was once a colony (Portuguese) and it has since been returned to China. 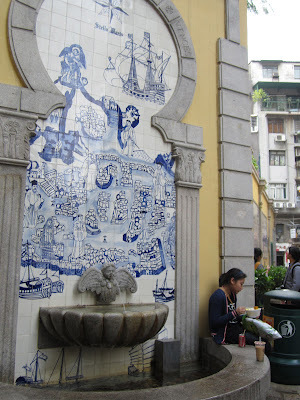 You can see evidence of its Portuguese history everywhere. 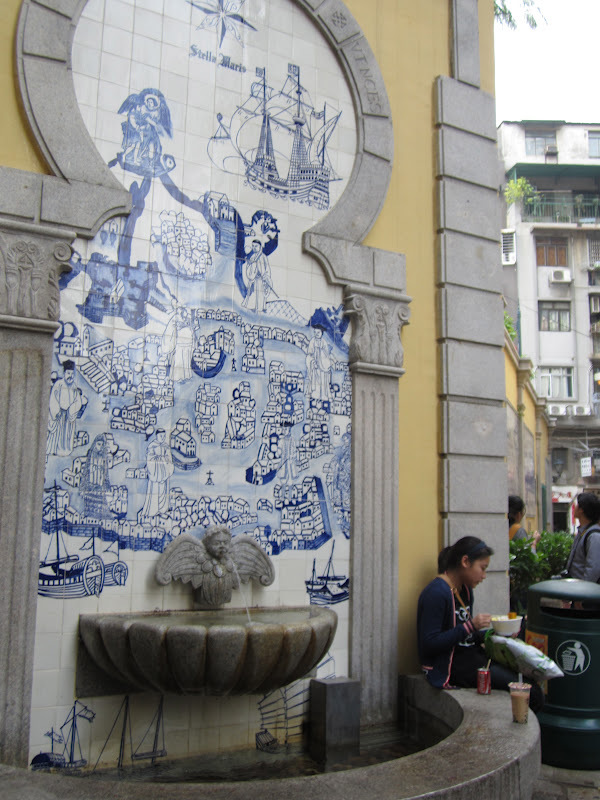 There are so many things to see in Macau that this walking tour will be in two parts. 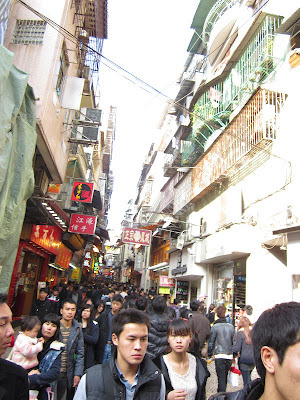 My most recent visit to Macau was during the Chinese New Year holiday. We saw a colorful market full of lucky New Year decorations. 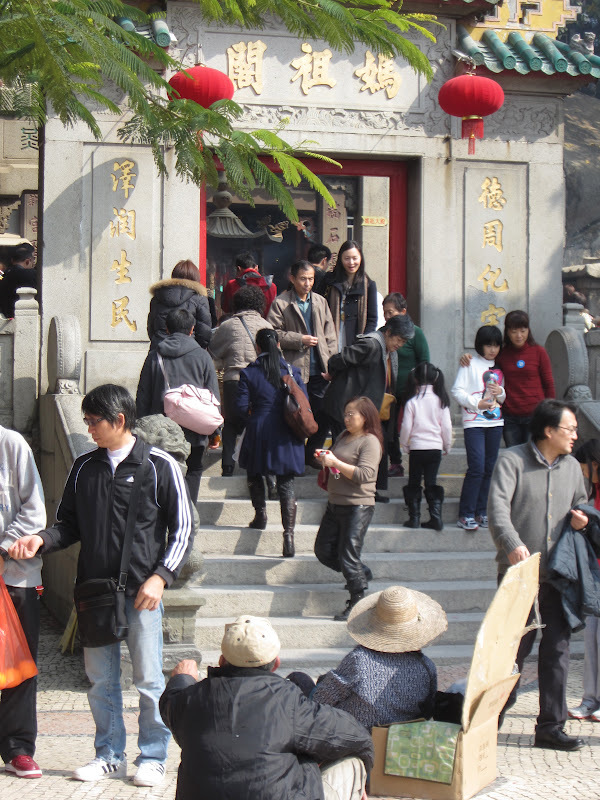 It was right outside the big temple, which was the busiest I've ever seen it. I don't like to take pictures inside temples and churches, so I snapped this picture of incense coils over the wall as we left. We left the temple and wandered into the backstreets of Macau. ...and wandered along the waterfront. 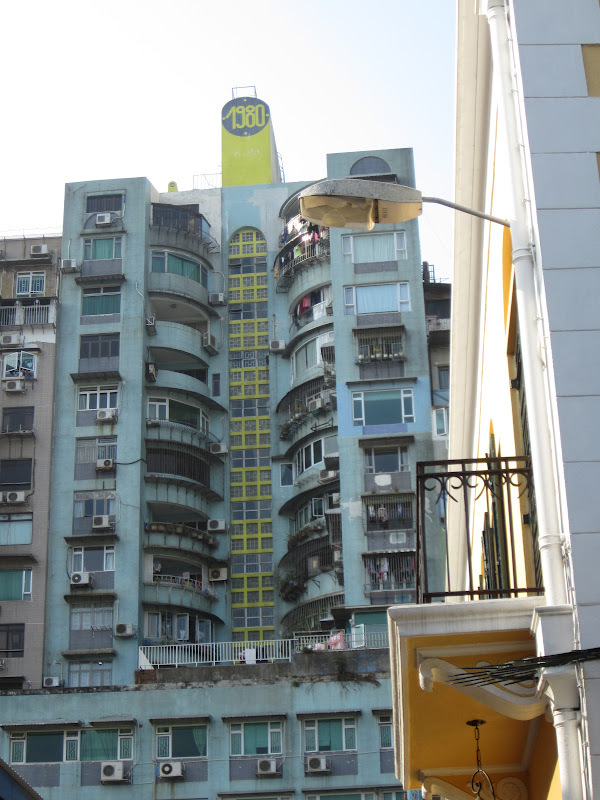 Macau is full of beautiful architecture. It's like wandering through a little piece of Old Europe in Asia. 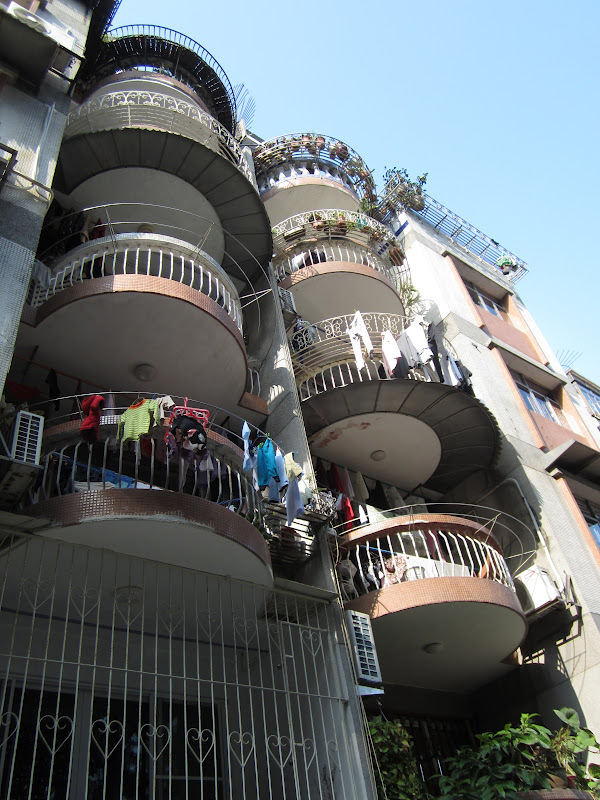 But every once in a while you are reminded of the modern side of the city, too. 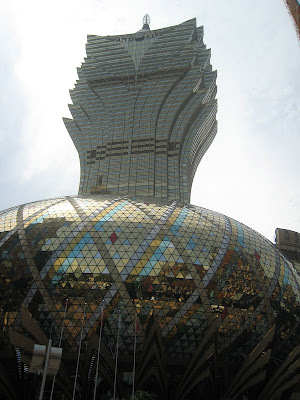 Macau is famous for its casinos, which bring in more gambling money than Las Vegas. This tour will focus on the older side of the city. There will be time to see casinos next week. 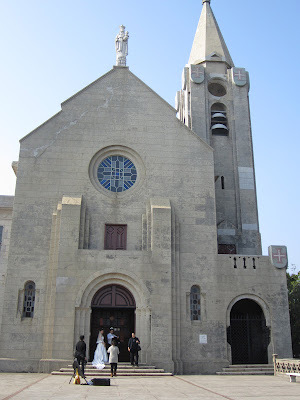 We climbed a winding cobblestone street to a church on a hilltop. We could see the little details of the surrounding buildings. This spot is a perfect snapshot of the disparate elements of Macau. The church itself is a beautiful relic of missionary work in Asia. It's also a popular destination for wedding photos. We walked down into a peaceful garden on the slopes of the hill, which was a nice respite from the city. After visiting the church, we meandered back down the hillside, where we saw the terraced houses that are characteristic of Macau. I like this city because everything is painted in soft, pastel colors. 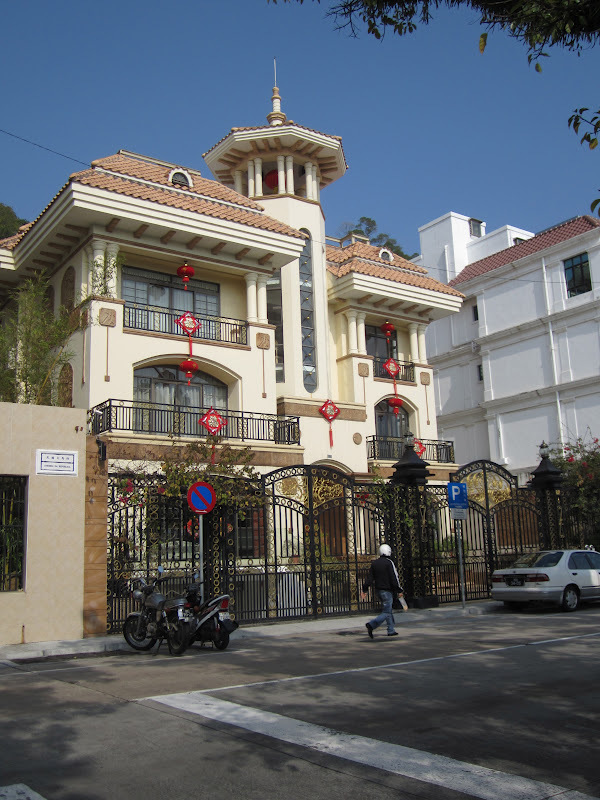 Even the Chinese consulate building is lovely. We made our way back down to the main streets, noticing the unique bits of architecture surrounding us. ...which was decorated for Chinese New Year. We walked beneath the lanterns and into a crowd of thousands. We found a second church, this one more famous because it is right in the middle of the tourist district. 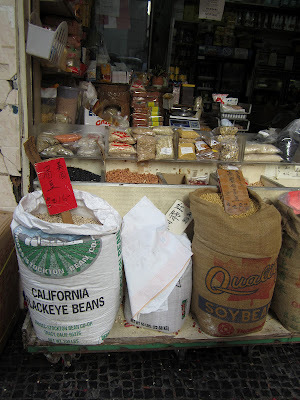 The street was lined with shops selling everything from food to designer clothing. And there were so many people! We fought our way past shops giving away samples of the famous pork jerky and egg tarts. Finally, the crowds spread out when we reached the steps leading up to the ruins of St. Paul's Cathedral. We arrived just as a lion dance was beginning. We stopped to watch the performance, which was the best lion dance I've seen yet. 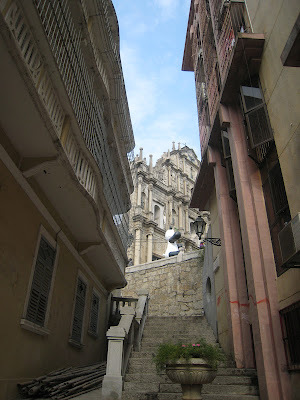 Then we made our way up the steps to the ruins of St. Paul's. We'll continue our tour of Macau next week. Come back to see more Portuguese architecture and the infamous casinos.